The historic Baldwin Building is the setting for an explosion for the senses in the epicenter of downtown. Formerly Durham’s foremost department store, the building is more than 90 years old. The upper levels of this Main Street landmark are now condominiums. Resident Rodney Derrick invites you to join in a uniquely fabulous “Latin Quarter” on Main Street experience. Start with a welcome cocktail from Prohibition-Era Havana and a small appetizer in the newly-opened COPA Cuban restaurant on the first floor. Then it is up to Rodney’s Art Loft on the third floor with its panoramic view of DPAC and the American Tobacco campus, and if lucky, a great sunset from the community roof. All the while the hallways and stairwells of all four floors of the Baldwin provide a visual feast of color and passion. 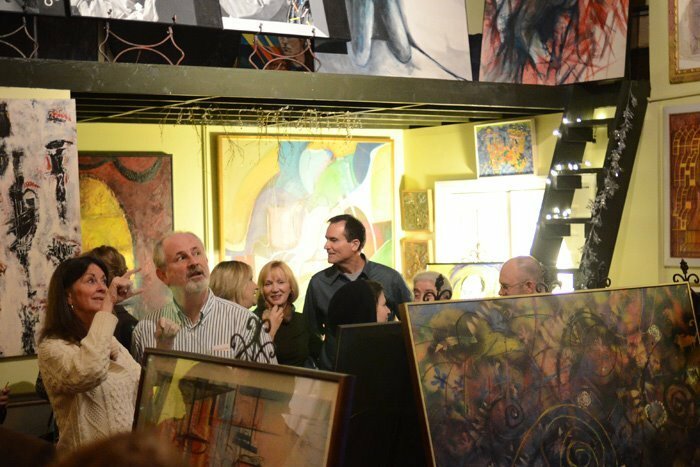 Including Rodney’s loft, they are filled with some 200 paintings: a third are by artists from South America, half are by international artists, 40 percent by women, and 10 percent have been exhibited in major international museums. Empanadas provided by LUNA Rotisserie & Empanadas. Traditional and Vegetarian Paella from Taberna Tapas. Caribbean Chocolate Delight from Chocolaty Confections. Cold Brew and hot Decaf Coffee from Caballo Rojo Coffee.